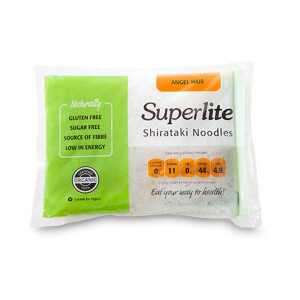 Superlite Shirataki Noodles are carbohydrate free, fat-free, wheat free, gluten free, sugar-free, soy free and lactose-free – the perfect alternative to heavy bread, pasta and grains. Made from konjac glucomannan – a soluble dietary fibre derived from the root of the konjac plant. The plant is found in eastern countries, but similar to our sweet potato. Medical studies link its positive effects on people living with type 2 diabetes, obesity, constipation and cholesterol; or those on low carbohydrate or low GI eating plans. Superlite Noodles come 'wok ready' and do not need to be cooked like pasta. They are therefore very quick and easy to prepare and extremely versatile, taking on the flavour of any meal. Stored at room temperature, the bags have a shelf life of 18 months. Please note that this product cannot be frozen. When making a stir-fry: Put your wok or your pan on a high heat. Add a healthy oil to the pan (we suggest coconut oil, olive oil, peanut oil, or avocado oil). Stir-fry for 2 minutes. Add some low sodium soy sauce, some chilli paste, or some pesto to taste. Add the rest of your ingredients. When making a saucy dish: Bring water to a boil in a pot, add a dash of salt and boil noodles for 1 minute. Drain well and add your sauce as usual.